So, we all love comforting chicken soup- it’s such a classic and cures all ills. 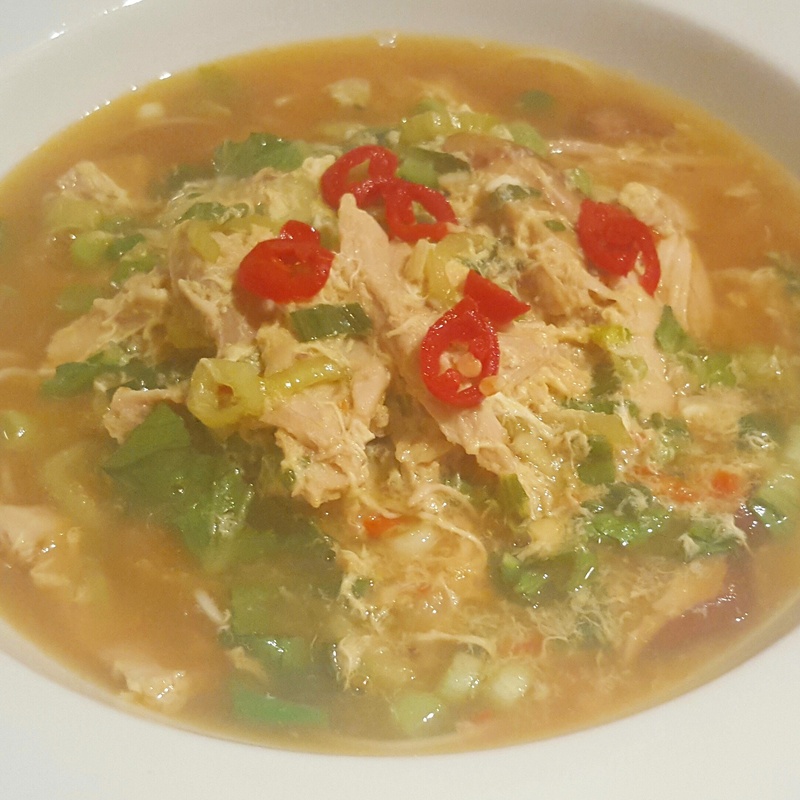 Well this is my twist on chicken noodle soup which is packed full of flavour and has taken inspiration from Chinese hot and sour soup. Hot and sour soup is exactly as it sounds- a combination of hot and sour ingredients which give a balanced finish. I have used leftover roast chicken for this recipe and the dark meat from a chicken is best to use if you can as this is more tender and have most taste. You can also use pork, mixed vegetables or even tofu for this if you prefer. As with a lot of Asian cooking, make sure you everything prepped as it won’t take long once you get going! 1. Start off by making the paste which forms the base of the soup. Simply grind the garlic, chilli and ginger in a pestle and mortar. Add a pinch of salt to help form the paste and set aside. 2. Bring a pan of water to a boil and cook the noodles until tender- this is usually 2-3 minutes depending on the noodles you use so remember to check the packet instructions. Drain well and run under cold water; this stops the cooking process and stop them sticking together as they cool. 3. Take a large pan which is going to be able to fit the stock and chicken in. Add a glug of oil over a medium heat and cook the paste for a couple of minutes before adding the mushrooms, spring onions and chopped stems of the pak choi. Pour in both types of soy, the rice wine vinegar and rice wine and cook for a further minute. Shred the chicken meat into smaller bite sized pieces and add to the pan; coat in the paste and sauce. 4. Next up goes the hot stock so carefully pour this into the pan; it is important that it is already hot before being added to the pan so don’t miss this out. Bring the stock to a gentle boil and leave for around 10 minutes until slightly reduced and the chicken is warmed through. Remember to taste as you go and adjust with more soy or vinegar to suit your tastes. Now for the fun bit! Hot and sour soup has egg which look like little strands of ribbon. To do this, take a chopstick and swirl the stock until a whirlpool forms. Gradually add in the whisked egg and keep the stock moving; you will see the egg cooking before your very eyes and dispersing- that’s all there is to it! 5. When you are ready to serve, divide the noodles between two deep bowls before serving the soup on top. The soup will heat the noodles again. Add the pak choi leaves to the soup at the last minute. Top with a little extra sliced chilli if you like and grab a spoon! This entry was posted in Recipes and tagged chicken, chilli, egg, garlic, ginger, hot and sour soup, noodle soup, pak choi, shitake mushrooms by sotiris14. Bookmark the permalink.